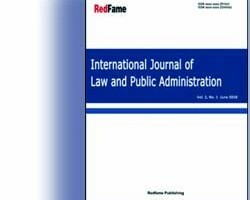 International Journal of Law and Public Administration is an international, peer-reviewed, open-access journal, published by Redfame Publishing. The journal is published semiannually in both print and online versions. IJLPA is striving to provide the best platform for researchers and scholars worldwide to exchange their latest findings. The journal accepts article submissions online or by e-mail.